Over the years I’ve had the fortune to be friends with several excellent chefs. What’s funny is that when I ask them what and where they like to eat, they don’t tell me about some 5 star restaurant or spout off some obscure or complex dish. I was surprised to learn that many professional chefs prefer simple honest meals made from a few quality ingredients at the end of the day. I often wonder if that same observation holds true with knifemakers. Whether they carry the high end knives they sell or reach for something simple, tried and true. Perhaps if they did subscribe to the less is more philosophy a Svord Peasant Knife might land on their work bench. After all, it doesn’t get more basic than this friction folder from New Zealand. Something about this simple knife has always intrigued me, so it’s high time to one out in the form of a full written review. The Peasant knife has an overall length of 8-1/4″, a 3-1/4″ blade, and weighs 2.53 ounces. There is also a mini version with a 2.5″ blade, and a giant version with an 8″ blade. The standard Peasant knife is on the larger side for my typical EDC, but it is carriable enough if that is what you want to do with it. The blade is a classic drop point shape, best characterized by the dramatic contrast of the dark scale left over from the heat treat with the bright satin finish of this hand ground blade. This is a knife that practically begs to come with a convex edge, but the edge is a traditional “V” bevel. I’ve heard some reports of people being dissatisfied with the out of box edge, but both of my Svords came sharp, and the grind itself is nice and thin. This is a decent slicer, and fared well in a variety of daily tasks. Svord went with L7 for the blade steel. L7 is a Swedish high carbon steel. It has all of the characteristics that I like about high carbon steels, mainly it exhibits good toughness and easily takes a very fine edge. Much like the rest of the knife, this is an honest hard working steel and it’s capable of getting a lot of work done. It does patina and will rust if you aren’t careful. Keep it oiled and there shouldn’t be any problems. If found it plenty tough for my purposes, and it held a nice edge under basic tasks like carving wood and breaking down boxes. The handle of the peasant knife is about as simple as can be. You have two generous slabs of plastic or wood, a single internal stop pin, and two oversize brass screws to hold it together. For what it is, it’s well finished but there isn’t a whole lot to write about. The Peasant knife is comfortable to hold. The handle slabs are simple and nicely contoured, so they will accept all sizes of hand without any issue. There is a fine texture on the plastic handled version, which feels good and offers a little grip. Despite the absence of any kind of lock, this is still a knife that you can get some hard work done with, and the comfortable handle makes the work all the more enjoyable. The peasant knife doesn’t have a pocket clip, so typically you will either carry it free-floating in your pocket, or perhaps on a belt sheath. It’s not impossible to EDC, but it’s a far cry from something like my Victorinox Cadet. The long protruding tang needs to be carefully negotiated, and it is not my go to pocket knife. However, it’s relatively light weight and the corners of the handle are all nicely chamfered; it is possible to daily carry this knife. Once again, as I venture further into the world of traditional knives I find that my typical system of organizing a review is a little less on point. For “deployment” you have the stick tang poking out of the back of the handle, and you can open the knife up by pressing on the tang. There are no washers or bearings or anything; the blade presses directly against the plastic handles. Oddly enough the knife is still smooth and satisfying to open. True to its name, there is a good deal of friction this folder, and I found that opening the knife was deliberate and purposeful. For “lock up” you have perhaps the worlds oldest folding knife design in place. While it isn’t the sexiest solution, as long as you have a firm grip on the handle the blade isn’t going anywhere. It’s actually very secure, even when doing some hard carving. No complaints with this non-locking folder. The Svord Peasant knife is about as simple as can be, and therein lies its charm. 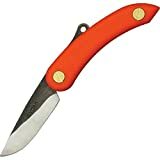 The low part count, slim and sturdy design, and quality materials make for a serviceable and robust folding knife. Staying true to it’s name this is a simple working man’s blade, and is about as comfortable outdoors as it is nestled next to my i-phone. If you haven’t checked one out, you really can’t go wrong. For $15 I can easily recommend it. I recommend purchasing the Svord Peasant Knife at Amazon. Please consider that purchasing anything through any of the links on this website helps support BladeReviews.com, and allows me to keep the site independent. As always, any and all support is greatly appreciated. Thank you very much. Great review Dan. I’ve always wanted to pick one of these up. I guess it’s time! Thanks, Andrew! Yes, the time has come! Are you not doing video reviews anymore? They were my favorite part of the site and it’s a bummer you haven’t done any for the last few reviews. Thanks for stopping by. I am glad you liked the videos. I had a lot of fun putting them together. Unfortunately, I don’t really see myself continuing to do them as they take so much time and effort to film and edit. I may dust off the camcorder at some point, but I’ve been so busy with work that I had to make the tough decision to either stop making the videos, or basically stop working on the site all together. This is all subject to change of course… and maybe I’ll figure out a way to do the videos that doesn’t take up so much time. I did enjoy putting them together. Even though there are lots of excellent Chinese made budget folders out on the market, and I own a few of them, there’s something about these primitive knives that I find fascinating. Like my Opinel, the Svord Peasant is a simple and very functional folder that I enjoy using. I do prefer using it with a sheath, which can be made of leather or cloth. Very light, and it’s so easy to put a screamin’ sharp edge on it. I can’t help but agree with you. I love the simplicity of this knife. It’s a folder distilled to its purest form. And at this price even the Chinese folders have a tough time beating it.